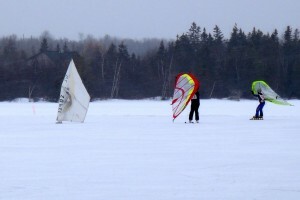 Kristin Conard checks out the oldest windsurfing sport: ice and snow sailing. 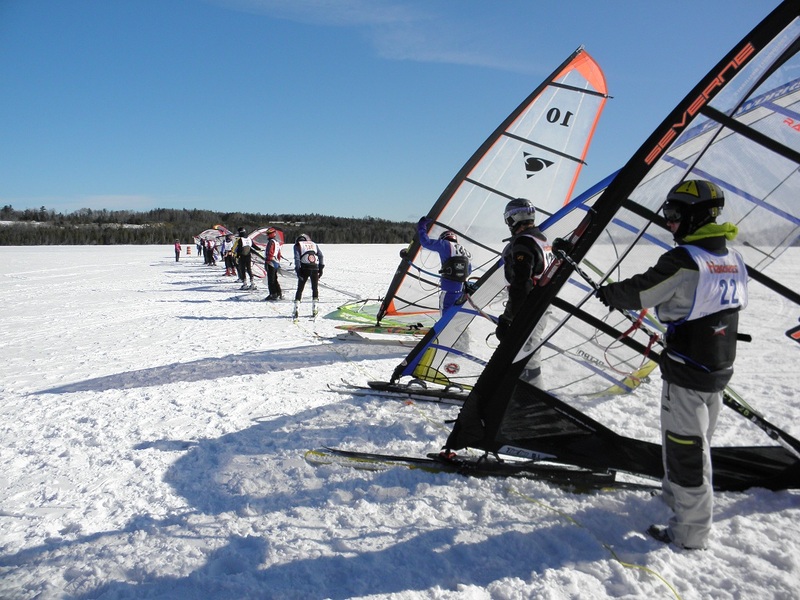 ST. IGNACE, in Michigan’s Upper Peninsula, hosted this year’s World Ice and Snow Sailing Championship (WISSA). Along with not even being aware of the existence of the U.P. 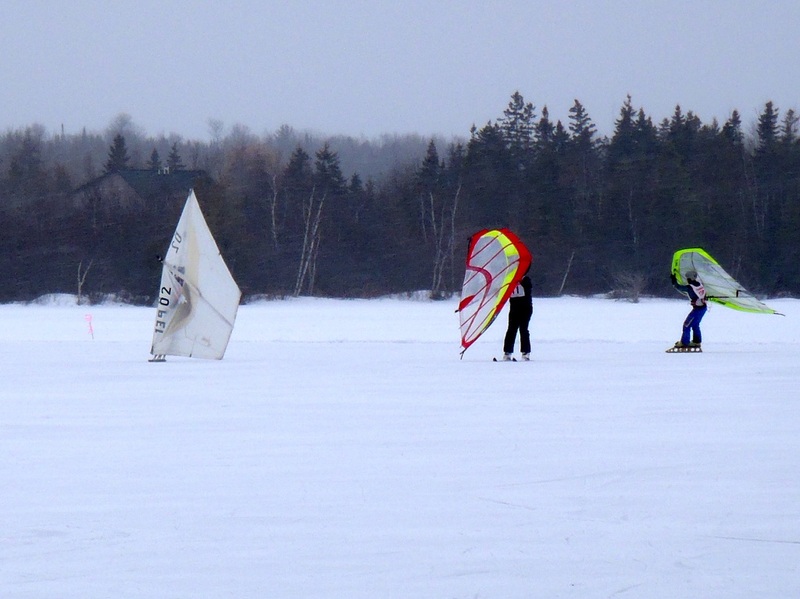 prior to this trip, I didn’t realize there was such a thing as ice and snow sailing. I’d seen windsurfing and kiteboarding out on lakes and oceans, but never on ice. Apparently, I’ve been missing an activity that’s been around for decades; WISSA is the oldest international windsurfing competition, started in 1980 in Helsinki. An event that relies entirely on ice and wind to be successful means spectators get to dress like they’re running the Iditarod. I blame my moving to California for my inability to appreciate the cold, and I was thankful for the unseasonably warm weather — highs in the mid-30s. With five layers of clothing on my torso, three on my legs, two pairs of socks, two hats, and a scarf, I was ready to watch the last days of the competition. There were 41 competitors from 8 countries. Most were from the US or Sweden along with a handful from Finland and one seemingly out-of-place entry from Cuba. 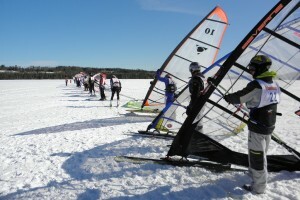 The competition is split into three classes: Sled Class, any sled powered by a windsurfing rig where the rider is standing; Hand-held Class, wing held directly by hand; and Kite Class, any wing connected by line. What you strap to your feet seems up to personal preference. I saw skis, hockey-style skates, ice skates 6 inches high, short snowboards with skate blades attached to the bottom…apparently you can cobble together pretty much anything for your feet so long as you have the wing, sail, or kite. While most of these looked uniform, it was the old-school design of the Swedish wing called the “drakseg” (dragon sail) that drew the most attention from spectators. Used by Lars Fromell, who I dubbed “the big Swede” in my head, the drakseg is massive and looks like a barn door. You have to be a certified badass to bust out the dragon sail surrounded by high-tech designs, and as the 2011 world champion and 3rd place finisher this year, Fromell pretty much owned it, handling the drakseg seemingly effortlessly. That’s the mark of a master though, isn’t it? The apparent lack of effort in difficult, technical maneuvers. Moving across the ice at speed (in the right conditions, you can get up to 60+ mph) is dangerous, particularly when you toss into the mix having to make turns and not hit any of the spectators. All participants are required to wear helmets, and most also have kneepads and spine protectors. The average wind speed in February around St. Ignace is 26.6 miles per hour. Much faster and it can be too much, slower and you can’t get anywhere. The week of the event, the wind dropped off, and I could feel the frustration of the organizers and athletes. “This place is like my backyard,” said one Swedish competitor, shaking her head. At the skipper’s meeting one morning (the daily gathering of athletes to go over the event schedule), one racer put in a request to use someone else’s kite, and without hesitation, gear was volunteered. That seemed to typify the camaraderie of the sport; with such a small yet devoted group of people that all seem to know each other, it was about the thrill of the wind and not necessarily the win.